After a wild and crazy 2018-19 regular season, the NBA Playoffs are set to begin this weekend. Both conferences appear to be wide open, but the first round should go mostly according to plan. Below is a preview of each of the eight first-round series with a prediction for each of them. The Milwaukee Bucks came out of nowhere to finish the regular season with the best record in the NBA at 60-22. Milwaukee is led by Giannis Antetokounmpo, who is averaging 27.7 points, 12.5 rebounds, and 5.9 assists per game. The “Greek Freak” will likely finish in the top-two in the MVP race. Detroit snuck into the eight seed in the East but could be without Blake Griffin to begin this series. Milwaukee swept all four games from Detroit in the regular season, and they should do the same in this series. The Milwaukee Bucks are winning this in 4 games. Kawhi Leonard averaged 26.6 points, and Kyle Lowry averaged 8.7 assists per game to lead the Toronto Raptors to the number-two seed in the East. The Raptors don’t have to worry about the Cavaliers this season, but they shouldn’t take the Magic lightly in the first round. Orlando has an All-Star center in Nikola Vucevic, who is a double-double machine. The Magic can also defend and are holding opponents to just 106.6 points per game. The Magic and Raptors split the four games during the regular season, and this series will be closer than most people think. Toronto is going to win this series, but look for it to go 6 games. The Philadelphia 76ers and Brooklyn Nets split their four-game season series this season, but I don’t see this series being all that close. The 76ers are averaging more than 115 points per game this season, and Joel Embiid is averaging 27.5 points per game. The addition of Tobias Harris gives the Sixers one of the most talented starting units in the NBA. D’Angelo Russell and Spencer Dinwiddie have combined for more than 38 points and 11 assists per game this season, but the Nets don’t defend well enough to win this series. Brooklyn might be able to sneak out a victory, but the 76ers will close this out in 5 games. This should be the most entertaining first-round series in the Eastern Conference, and it has the potential to go 7 games. Boston won 3 of the 4 games from the Pacers in the regular season, but the games were extremely competitive. The Pacers are allowing just 104.7 points per game this season which leads the league, and they are tough to beat at home. Kyrie Irving and Jayson Tatum have combined for more than 40 points per game this season, but the Celtics struggle to score at times. Boston will also be without Marcus Smart for the entirety of this series, and that is a huge loss. I’m not betting against the Celtics on their home floor, and they will win the series in 7 games. There will be plenty of points scored in this series, as the Warriors and Clippers are both averaging more than 115 points per game. Stephen Curry and Kevin Durant have combined to pour in 53 points per game this season, and the Warriors can really shoot it. Lou Williams comes off the bench to score 20 points per night for the Clippers, and they won’t be afraid to run with Golden State. The Warriors won 3 of the 4 games from the Clippers in the regular season, and they will make short work of this series. Take the Golden State Warriors in 5 games. This will be the biggest surprise of the first round of the NBA Playoffs. The Spurs and Nuggets split their four games in the regular season, and there isn’t a huge gap in talent between the two teams. Denver allows just 106.7 points per game, but score only 110.7 per night. San Antonio shoots almost 40 percent from the three-point line, and have a 1-2 punch with DeMar DeRozan and LaMarcus Aldridge. The Spurs also have a huge edge in coaching in Gregg Popovich. Denver had a terrific regular season, but they are losing this series. Take the San Antonio Spurs in 7 games over the Denver Nuggets. The Oklahoma City Thunder looked like a top 4 team this season, but they stumbled late. Portland has had a terrific season, but they are playing without their center. Oklahoma City won all four games against the Trail Blazers this season. Paul George is averaging 28.0 points per game for the Thunder, and Russell Westbrook is a triple-double machine. Damian Lillard and CJ McCollum are a dynamic duo for Portland, but they don’t have a ton of depth. This should be another high-scoring series that will go the distance. Look for another upset in this series with the Oklahoma City Thunder winning the series in 7 games. The Houston Rockets are not happy with being the fourth seed in the West, but they are going to have to rebound in a hurry. James Harden has been an unstoppable force all season long and is averaging more than 36 points per game. Utah has allowed just 106.5 points per game this season, and they will do all they can to slow him down. Even though the Jazz are always tough to beat at home, they just don’t have enough scoring to keep this series close. Take the Houston Rockets in 5 games over the Utah Jazz. With less than 20 games left in the NBA regular season, the playoff races in each conference are starting to be decided. The NBA Playoffs are always exciting, but this might be the most competitive playoffs in quite some time. Let’s take a look at the updated betting odds to win the 2019 NBA Finals. 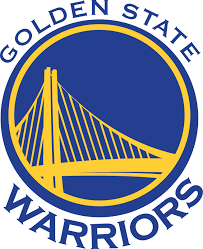 Golden State Warriors 1/2: It should come as no surprise that the Golden State Warriors are the overwhelming favorites to win the 2019 NBA Finals. The Warriors are the top seed in the Western Conference and have made some acquisitions to improve their roster. Beating the Warriors four times in one series isn’t going to be easy. 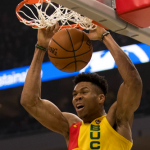 Milwaukee Bucks 8/1: The Milwaukee Bucks are the best team in the Eastern Conference, and look like a real threat to the Warriors. Milwaukee is led by Giannis Antetokounmpo and can score with everyone. Surviving the East will be tough, but the Bucks have to be considered the favorite to win the conference. 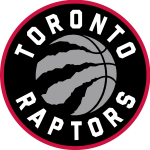 Toronto Raptors 12/1: The Toronto Raptors are once again one of the top teams in the East, but this time won’t have to contend with the Cleveland Cavaliers. Kawhi Leonard is thriving in his first season in Toronto, and the addition of Marc Gasol has the Raptors poised for a deep playoff run. The Raptors have a ton of depth, and this could be the year that they get to the Eastern Conference Finals. 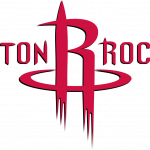 Houston Rockets 15/1: The Houston Rockets very nearly knocked off the Warriors a season ago, and they are back to playing great basketball. James Harden is putting up eye-popping numbers, and the Rockets can shoot. Don’t be surprised to see a rematch of last year’s Western Conference Final again. 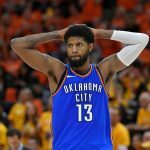 Oklahoma City Thunder 25/1: Russell Westbrook is averaging another triple-double this season, and Paul George looks like an MVP candidate for OKC. The Thunder are absolutely for real, and they won’t be afraid of anyone in the playoffs. Don’t sleep on the Oklahoma City Thunder. 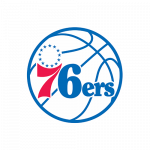 Philadelphia 76ers 25/1: When Philadelphia brought over Tobias Harris before the trade deadline, it might have given them the best roster in the league. The Sixers can score points in many different ways, but they still need more buy-in at the defensive end. If the Sixers are able to get some momentum, they are hard to stop. 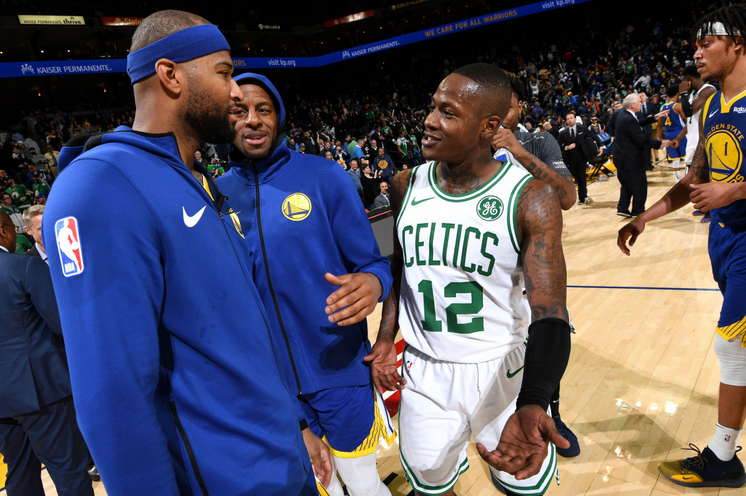 Boston Celtics 30/1: The Boston Celtics have been a complete mess of late, but they just pulled off an impressive win against the Golden State Warriors. Boston nearly made it to the NBA Finals a season ago and has one of the talented rosters in the league. The Celtics might be the number 5 seed in the East, but don’t overlook Boston in the playoffs. 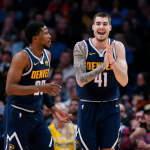 Denver Nuggets 30/1: The Nuggets still struggle to score points, but their defense will keep them in every game throughout the playoffs. 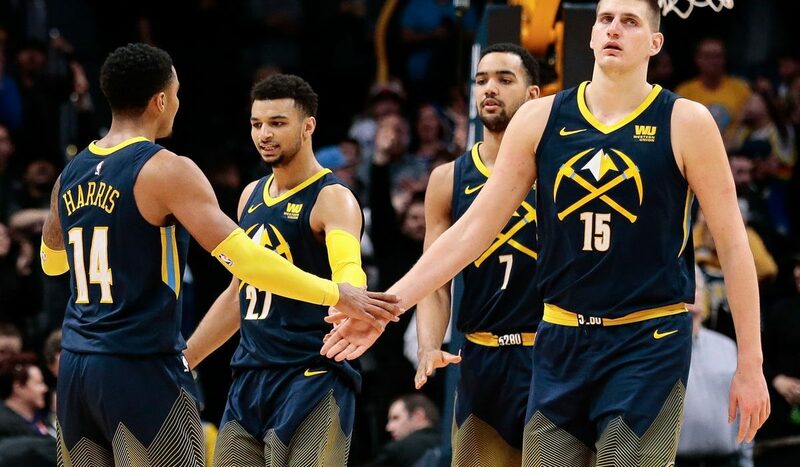 All-Star Nikola Jokic and Jamal Murray are capable of carrying the offense to some wins, and the Nuggets should have the 2 seed in the Western Conference. They don’t get a ton of publicity or hype, but Denver is really good. Utah Jazz 50/1: The Jazz lack consistency and depth, but have had another solid season. Utah will be a tough out for any team in the playoffs, but they likely won’t be able to win a playoff series. The Jazz are a good team in a great conference. Portland Trail Blazers 75/1: It’s kind of surprising to see the Trail Blazers this far down on the list. Portland has a dynamic duo in the backcourt, and they are next to impossible to beat at home. The Blazers know that they can beat the Warriors, and they won’t be scared of anyone. Portland is my sleeper pick to win the 2019 NBA Finals. 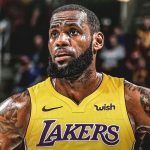 Los Angeles Lakers 150/1: Not even LeBron James can save the Los Angeles Lakers. The Lakers are going to miss the playoffs for the 6th straight season and will fall off of this completely soon. Los Angeles needs to greatly improve their roster, or their odds won’t improve much heading into next season. San Antonio Spurs 150/1: The San Antonio Spurs are clinging to the eighth and final playoff spot in the Western Conference. Even if the Spurs make the playoffs, they aren’t getting past the Warriors in the first round. San Antonio isn’t the same team as they once were. Indiana Pacers 225/1: The Pacers looked like a real contender to win the NBA title a few months ago, but a season-ending injury to Victor Oladipo knocked them down a peg. Indiana has still maintained the third spot in the East, but the Pacers don’t have enough offense to truly challenge for the NBA title. Sacramento Kings 500/1: The Sacramento Kings are still just outside of the playoff race, but they have had a terrific season. The Kings aren’t a real threat to win the 2019 NBA title, but their time is definitely coming. Sacramento is loaded with young talent. Everyone Else 1000/1 or Higher: This group of teams is barely hanging on to eligibility, and most will be eliminated in the coming weeks. Not much to see here. NBA Free Agency has been very exciting thus far. 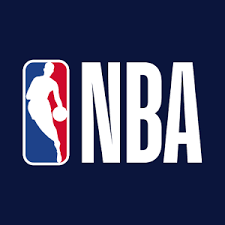 Read below as we recap what’s happened around the NBA in the past week. NBA Free Agency was supposed to start at midnight on July 1st, but a big party at Russell Westbrook’s house a few hours earlier is what kicked off free agency. Paul George, the guest of honor, got up on stage and announced he was re-signing with the Thunder. It was a 4-year deal worth $137 million. 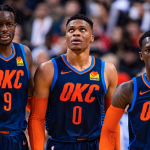 Jerami Grant and Raymond Felton have also re-signed with him, while the team also nabbed Nerlens Noel as a backup, a major upgrade at the backup center spot from a year ago. This one is only big because it is happening a few years after it was supposed to. 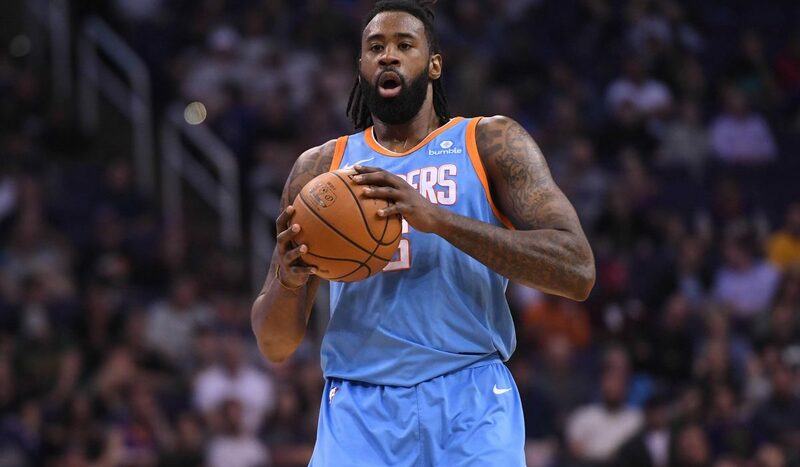 After signing with the Mavericks in 2015 in the “moratorium period” DeAndre Jordan got cold feet and ended up returning to the Clippers. This offseason, he signed with Dallas for one year and $24 million. He is finally a Maverick. Chris Paul and the Rockets came to terms on the max contract that Paul wanted. A 4-year $160 million deal will enable them to, as Paul phrased it, “run it back again”. This happened very shortly after George’s signing, and showed that the Rockets are still trying to get past the Warriors. They lost Trevor Ariza to the Suns, but they also added Michael Carter Williams for PG depth, and re-signed Gerald Green, who is a strong candidate to replace Ariza in the starting lineup. On Sunday, less than 24 hours after PG and Chris Paul signed their deals, LeBron James had his turn. It was announced through his agency, Klutch Sports, that he would be taking his talents to Hollywood, and joining the Los Angeles Lakers. It hardly comes as a surprise that he left the Cavs after the way they relied so much on him in the postseason. He had to consistently play 45-48 minutes and it was too much of a toll on his body. This makes the Lakers instant contenders. It’s yet to be seen if a second star will be joining him, but the team has also added JaVale McGee, Lance Stephenson, Rajon Rondo, and re-signed Kentavius-Caldwell Pope on one-year contracts. The Lakers did not have money to maintain Julius Randle after these signings, who took his talents to New Orleans, on a 2-year $18 million deal. Perhaps, the most intriguing move of all, was completed by the Warriors. For the second time in three offseason, they have completed a major signing. Widely regarded as one of the best centers in the NBA, DeMarcus Cousins signed a 1-year $5.3 million (!!!) contract to join the Warriors. He tore his Achilles in January and missed the rest of the year, which left only a few suitors. Aware of this Golden State went out and decided to try and form the greatest five-man lineup we have ever seen, pairing Boogie with Steph, Klay, KD, and Draymond. For only $5 million, they get a guy that averaged 21 pts and 11.5 rbs per game over the last 10 seasons. Nikola Jokic has been turning heads ever since he got to Denver, and he has improved his play and stats significantly over the course of his first three years in the league. He has helped turn the Nuggets into a contender with his unique skillset, and this is well deserved. As Phoenix’s best player by a wide margin, this was a move that had to happen. Though he is just 21 years of age, he is one of the NBA’s top scorers. He has already scored 70 in a game, and proven his ability to be clutch in late game situations. Now teamed with DeAndre Ayton, Phoenix’s future looks bright. After making an appearance as an important character in the new film Uncle Drew, which hit theatres last week, Gordon has inked a new contract to remain in Orlando. The 6’9” combo forward stays put, and is a guy the Magic will need to become more consistent. He is known mostly for his flashy dunking ability more than anything else, which will have to change for this team to contend. 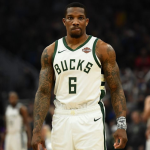 A greatreat move by Orlando, and it seems that new coach Steve Clifford will know just how to utilize Gordon’s ability, having coached Marvin Williams, who has a similar skillset. Think about this: All of this has happened in just the first week of free agency. There a number of big names (Marcus Smart, Jabari Parker, etc.) still out there. Stay tuned. The 2018 NBA draft is just three weeks away and because there are so few players on a roster, no league’s draft impacts the teams more than the NBA one does. Draft night is always a wild affair with trades, movement, and rights flying from one team to the next, which makes projecting the actual draft very difficult. As a result, a big board will review who might be the top 10 picks without regard for individual team needs or preference. 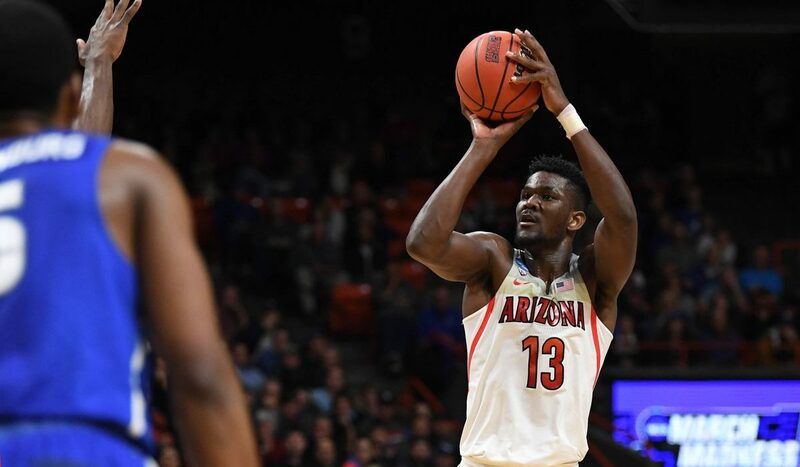 Ayton is a physically imposing figure who is over 7 feet tall and pure muscle. He fits in today’s NBA because he can shoot threes and defend every position. Ayton answers the question, ‘What would happen if you combined Shaq and Al Horford,” c combination which makes him the top prospect in the draft. Doncic has already played basketball professionally, and he has demonstrated an outstanding feel for the game. He is a 6 foot 8 point guard with elite passing skills, but a limited shot. In other words, he is Spanish League Ben Simmons or Oversized Ricky Rubio depending on the level of optimism one has for his outlook. Bagley was one of the most productive players in the nation last season, averaging 20+ points and over 10 rebounds a game. The Duke product is a pure athlete, who can score basically at will. The obvious comparison is Justice Winslow because of their school, left-handedness, and even their hair. Bagley’s ceiling is higher than Winslow’s, but he is currently less skilled. If Porter had not gotten hurt, he would probably have been the first pick in the draft. Teams have to worry about Porter’s back, but the all-around talent is obvious. For a team with depth and a bonus lottery pick (think Philadelphia) a guy like Porter is absolutely worth the risk. Other organization may not want to take a leap of faith on Porter, but based off of talent alone he will be intriguing to many teams. Bamba is an elite defender and projects as the best rim protector in the draft. Known for his intelligence and length, Bamba could evolve into a captain and leader reminiscent of a player like Robert Parrish. It is unclear what his offensive game will look like down the road, but he can definitely play a Clint Capela-like lob game right now. Many scouts feel that Jackson can easily be one of the top 3 players in the draft class because of his shooting ability combined with his size. Jackson needs to show more before being placed that highly on the big board. He only averaged 10 and 6 at Michigan State this year and he is not so athletic that he jumps off of the screen. Anyone taking Jackson this high is assuming a bit of a risk because he may not develop in the way that the team hopes he will. Sexton plays a bombs-away style suited for today’s NBA game. He is athletic and fearless when it comes to attacking or taking a long 3. 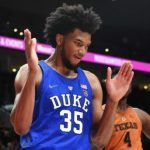 Sexton is a shoot-first point guard which will not fit in every system, so whichever NBA team drafts Sexton they need to have alignment between coach and player or it could go south quickly. Knox is a prototypical NBA 3 from about 6 years ago. He is long and slender with athleticism and a strong shot. In today’s NBA with more switching and position-less basketball, he will get taken advantage of in the post until he can get a little bit bigger. Right now he is a more slender Otto Porter, but an NBA diet, workout plan, and aging will help Knox physically. Just about every draft expert has Carter a few places higher, but he does not really have a position. NBA teams are more likely to draft someone with athleticism and upside like Sexton or Knox than grab a steady, but limited player like Carter. Carter is like Elton Brand and would have been a much more desirable player in an older era of the NBA. A fall outside of the top 10 would not be a shock. NBA teams will love Young’s range and guts, but he clearly needs better coaching and a shorter leash than he had at OU. Many people compare him to Steph Curry, but the concern is that he will have a career more like fellow Oklahoma alum Buddy Hield. Young will probably go higher than 10th, but at only 180 pounds he is likely to become a defensive liability. His shooting skills are intriguing, but his one-dimensional nature is a concern. The NBA draft is coming up on June 21st and teams will have to decide if they want to grab the guy with upside or the more NBA-ready talent. If a franchise wants shooting, the class of 18 has that and there are rim protectors as well. Tune in to see all of the draft day craziness as the future of the NBA is picked in three weeks. The NBA Playoffs second round is set to begin this week. There are some very intriguing matchups set to take place, with some familiar teams in the mix. The Western Conference appears to feature two dominant teams, Houston Rockets and Golden State Warriors. The Eastern Conference meanwhile appears to be wide open. 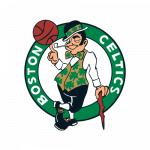 The Boston Celtics will take on the Philadelphia 76ers in what should be a very competitive series, but won’t last 7 games. The Toronto Raptors and the Cleveland Cavaliers are set to square off in a series that is almost certain to go the distance. The Cleveland Cavaliers almost didn’t make it to the second round, but were able to hold off the Indiana Pacers in game 7 to advance. The Cavaliers were able to survive thanks to a historic performance from LeBron. James averaged over 33 points and 10 rebounds per game in that 7 game series. LeBron was even better in game 7, scoring 45 points to lead the Cavs to the series win. The problem for Cleveland is that they have yet to find anyone who will consistently step up to support James. Kevin Love is the only other player who averaged double figures in round 1, and he only averaged 11.0 points per game. In round 2, the Cavaliers must find more scoring options if they want to advance. The Toronto Raptors are once again led by DeMar DeRozan and Kyle Lowry, but they have plenty of help behind them. DeRozan led the Raptors in round 1 by averaging 26.7 points per game. Lowry, meanwhile, averaged 8.3 assists per game and is great at putting his teammates in a great position to score. The Raptors have plenty of star power, but it has been their depth that has powered them so far in the playoffs. Toronto had 11 different players average over 10 minutes per game in round 1, and head coach Dwane Casey has a variety of different options that he can use. Casey is a top candidate for Coach of the Year Award in the NBA this season. 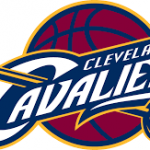 The Cleveland Cavaliers and the Toronto Raptors faced off three times during the regular season, with the Cavaliers winning two of those games. The Raptors blew out the Cavaliers on January 11, beating them 133-99. This game took place before the trade deadline, and the Cavs roster was a lot different at the time. After the roster overhaul, the Cavs defeated the Raptors in both of their meetings. 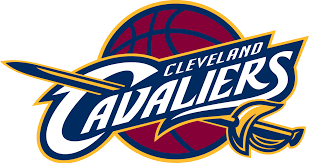 Cleveland beat the Raptors on March 31, 132-129, and on April 3, 112-106. All three games were extremely high scoring affairs, and this playoff series should be no different. This is the third straight season that these two teams will square off in the Eastern Conference Playoffs. The Cavaliers have had the upper hand in recent years, and own an 8-2 overall playoff record against the Raptors. In 2016, Toronto gave the Cavs a battle in the Eastern Conference Finals before ultimately falling, 4 games to 2. Last year, the Cavaliers swept the Raptors in the Eastern Conference Semifinals en route to another NBA Finals appearance. The Raptors constructed their roster in a way to challenge the Cavs, and they feel they are more ready to compete this season. LeBron James doesn’t seem ready to give up his throne as Eastern Conference champion. The Toronto Raptors and the Cleveland Cavaliers were both top 5 scoring teams during the regular season. The Raptors however were much better than the Cavaliers in points allowed. The Raptors were tied for the top spot in opponent’s scoring average and also finished 2nd in the NBA in scoring margin. The Cavaliers have not been a very good defensive team all season, and that trend continued in round 1 of the playoffs. On paper it appears that the Toronto Raptors are the much better team, but they don’t have LeBron James on their roster. LeBron is the best player on the planet, and he proved in round 1 that he will not let the Cavaliers get knocked out easily. Toronto knows that the depth of their roster is much better than that of the Cavs, but they don’t have that one player that can win them a game if needed. Toronto is tired of getting eliminated by the Cavaliers, and they appear to be primed and ready to exact some revenge this season. LeBron James appears ready to deliver whatever is needed of him in order to stay atop the Eastern Conference. The Raptors are good enough to push the Cavaliers to the brink, but must prove it can deliver the knock out blow. This will be a series that will be talked about for a long time. The NBA playoffs are almost upon us. Many people believe that this year’s postseason is the most open and hard to predict of any playoffs in recent years. The Eastern Conference landscape is particularly hard to predict as the NBA’s second season begins, but that will not stop us from trying to pick who will win it all. Brief betting note: if you are going to wager on the eventual NBA champion, shop around for the best odds you can find. They tend to vary from one place to another. On the one hand, the Warriors appear to have stumbled their way into the playoffs, making them an unappealing option to pick to win. On the other hand, getting the Warriors at plus money is a huge improvement in the payout compared to other points in the year. Advice: The Warriors appear too vulnerable to grab, even at 3:2. Pass. Amazingly the Rockets have the same odds as the Warriors to win the championship. When the big 3 play for Houston, they have been nearly unstoppable, which justifies such a number. Would anyone be all that surprised if the Warriors got it together and beat the Rockets at some point? Advice: It is hard to bet on anyone out west with the Warriors looming. Stay away. A 4 seed has the best odds to win the conference? Surely this is the Lebron factor at work, impacting the pricing considerably. The case could be made that the odds should be substantially longer than this given the likely path to the finals, but many feel that until Lebron loses, the eastern championship is his to lose. Advice: 8:1 does not represent the actual odds of the Cavs getting to the finals and betting them here is paying a steep price because of the Lebron brand. Look elsewhere. Betting the Raptors in this spot really comes down to one question: Can they get passed the Cavs? Toronto has struggled mightily in the playoffs, but this team is different. Advice: Getting a 1 seed at 12:1 seems like a no-brainer. It is hard to have much faith in them because of past performance, but making a smallish bet on Toronto seems like the mathematical play. Advice: The Sixers are the hot ticket at this point, and with good reason. Betting on the Sixers to win the championship sets up the possibility of a hedge if they get to the finals. Talk about a huge leap in odds from the Sixers to the Thunder! 40:1 on a team featuring Westbrook. PG-13 and Carmelo is certainly intriguing because of all of the firepower. The Thunder will not be scared or intimidated by the Rockets or Warriors. Advice: if someone other than GSW or Houston is going to represent the west in the finals, the Thunder certainly make the most sense. It seems unlikely that will happen, but at 40:1 the Thunder are worth a small bet. Utah boasts one of the best home court advantages in the league and plays the best defense. The combination makes them a very dangerous team, somewhat reminiscient of the Pistons teams of the early 2000s. Advice: Utah lacks the firepower to compete with the other teams in their conference. As attractive as 60:1 seems, it is better to pass. The Boston Celtics are now in the 100:1 range, which represents an overreaction based upon injuries. Many experts believe that Brad Stevens is the best coach in the NBA, giving them an edge. Boston could have a Milwaukee, then Miami and finally Toronto path to the finals, which is not all that inconceivable. Advice: Getting Boston at 100:1 seems like a good place to take a shot. They have virtually no chance against the team from the west, but if they get that far, there will be hedging opportunities aplenty. None of the teams are complete enough to threaten the top dogs in their respective conferences. If Kawhi Leonard magically returns to the Spurs, then they would be worth a look. Outside of that happening, the other teams are not worth your hard earned money. The NBA playoffs are an exciting event that lasts for a month and a half. Betting on a few teams to take home a ring only adds to the fun of watching. Take a small shot on Boston, Oklahoma City, and Toronto with a slightly larger wager on the Sixers. 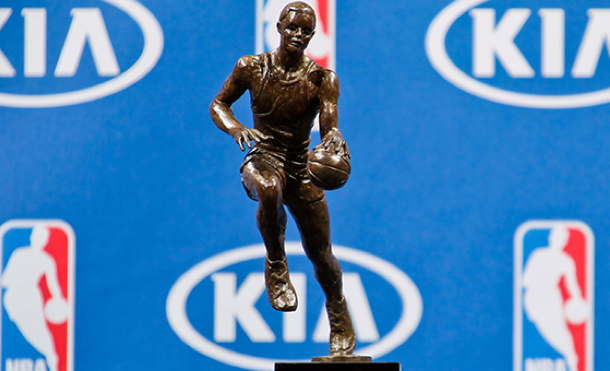 The 2018 NBA MVP award won’t be announced for a couple more months, but it’s never too early to discuss the players involved and give our pick and prediction for the award. Let’s take a look at the current odds to win the highest individual honor in the NBA. James Harden is the run away favorite to win the MVP award. Not only is he the leading scorer in the league, but his team has the best record in all of the NBA. Harden is scoring just shy of 31 points per game, and also dishing out 9 assists per game. He finished runner up to Russell Westbrook a season ago, and was pretty motivated to make sure he did not finish second place this season. You cannot talk about the Most Valuable Player award in the National Basketball Association without mentioning the name LeBron James. While the Cleveland Cavaliers have been a roller coaster this season, they are still in contention, and until someone in the Eastern Conference beats them – they are the team to beat. LeBron James is 4th in the league in scoring with 27 points per game. James is also second behind Russell Westbrook in assists with 9 per game. The Greek Freak has the Milwaukee Bucks in postseason contention. The 6’11 power forward from Greece is still jsut 23 years old. He is scoring nearly 28 points per game, and ripping down more than 10 rebounds per game. While he likely will not win it this season, he is going to grab a MVP award before he is done in the league. The point guard from the Golden State Warriors is tied with the shooting guard of the Golden State Warriors. It’s awfully hard to pick Steph Curry or Kevin Durant to win the MVP award, when they both are as valuable to their team. Curry is scoring 26.8 per game, while Durant is just shy of that. The fact that the Golden State Warriors won a title before Kevin Durant came to down has some thinking Curry is actually more valuable. As we talked about with Steph Curry, can you really pick him to win the MVP award? If you don’t like Steph Curry or Kevin Durant, two more All Stars with Klay Thompson and Draymond Green. That’s more than most teams have had in a decade. A team with four All Stars on their team makes it a little difficult to give them the benefit of the doubt in MVP voting. Durant, along side his scoring is 4th in the league with nearly 2 block shots per game. The point guard in Boston is 11th in scoring with barely 25 points per game. Irving is making nearly 89% of his free throw attempts this season as well. Irving is adding 5.1 assists and 3.7 rebounds per game for the Celtics. Brad Stevens has his Celtics right in the mix at the top of the Eastern Conference once again, and that’s due in large part to the play or Irving. It’s going to be tough for the defending MVP winner to grab it again. He added Paul George and Carmelo Anthony to his team, which has hurt his scoring a bit. But, if you look at the numbers for the Oklahoma City point guard, he is right near the triple double line once again. Westbrook is scoring 25.4 points per game, dishing out 10.2 assists per game, and ripping down just shy of 10 rebounds per game. His numbers are not too far off what they were a season ago. If the MVP award was given to the best player during the month of February – this New Orleans Pelicans big man would be the winner. Davis was absolutely out of his mind in February. The big man for the Pelicans has them in the fourth seed right now in the Western Conference. Davis is scoring 28.1 points per game, and adding 11.1 rebounds per game. He keeps up his February numbers through March and April, and it’s hard NOT to vote for Anthony Davis. Our pick to win the NBA MVP in 2018 is James Harden. He is far and away the favorite, but there are several other really good choices, such as Anthony Davis in New Orleans, who is leading his Pelicans to win after win, despite losing his running mate DeMarcus Cousins. Best of luck with your NBA Betting! Make sure you check out our US sports betting sites for all the best odds! 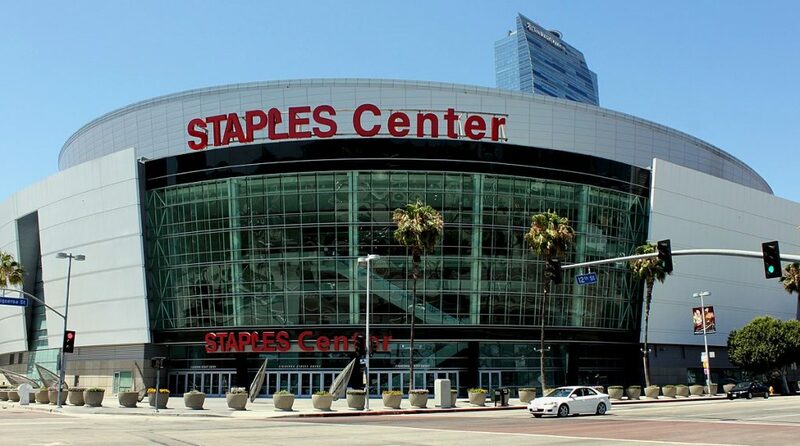 The 2018 NBA All Star Game will take place this weekend from the Staples Center in Los Angeles. Many of the best players in the league will gather, and the format has changed this season, so it will be interesting to see how the new changes look at the game. The 2018 NBA All Star Game is not playing the Eastern Conference against the Western Conference… This year – Team Steph will take on Team LeBron. Let’s talk about that and more in our look at the 2018 NBA All Star Game. Team LeBron – of course is led by LeBron James. James, who is a staple in the NBA Finals season after season has his Cavaliers as the third seed in the Eastern Conference despite all the controversy. LeBron is scoring 26.5 points per game, ripping down 8.1 rebounds and passing for nearly 9 assists per game. DeMarcus Cousins was originally a starter for Team LeBron, but his injury will sideline him. He is not the only injury for Team LeBron. Kristaps Porzingis, John Wall and Kevin Love were all chosen to the team, but will not play. The rest of the starters for Team LeBron include big man Anthony Davis of the New Orleans Pelicans. The big man scored 52 points in the All Star Game a season ago. This year, he is scoring nearly 28 points per game. Kevin Durant and Kyrie Irving will join Team LeBron. Durant, out of Golden State has been to the All Star game 9 times, and was the Finals MVP a season ago. Back in 2014, Durant won the MVP award. Kyrie Irving was the 2014 Kia All Star Game MVP, and has been to the All Star game 5 times. The point guard has the Celtics second in the Eastern Conference. The rest of the roster for Team LeBron will feature LaMarcus Aldridge, who has been battling injuries for the San Antonio Spurs. Bradley Beal is a first time All Star, and one of the best three point shooters in all of the league. Goran Dragic will also play in his first All Star game. He is the first player ever from Slovenia to be named an All Star. Andre Drummond is having a monster season for the Pistons. He was the rebound leader two seasons ago, and is ripping down nearly 16 per game this season. Paul George, Victor Oladipo and Kemba Walker round out the team for LeBron. Oladipo was the #2 pick in the 2013 draft, and making his first appearance, while Walker is a deadly shooter and can get to the basket with the best of them. Team Steph has an interesting arrangement of All Stars. Steph Curry is a two time Kia NBA MVP, and is having another elite season for the Warriors. The guard is scoring just under 27 points per game, as Golden State looks to win back to back titles. He will be joined in the starting lineup by the Greek Freak, Giannis Antetokounmpo, DeMar DeRozan, Joel Embiid and James Harden. The Greek Freak is scoring nearly 28 points per game, and making his second trip to the All Star game. DeRozan leads a Toronto team that has the best record in the Eastern Conference. He is the Raptors all time leading scorer. Embiid is making his first All Star appearance. The Process is scoring 24 points per game, along with 11 rebounds per game. Finally, James Harden – the most likely choice for NBA MVP. Harden is scoring 31.4 points per game, which leads the league. The reserves for Team Steph include two of his teammates. Draymond Green and Klay Thompson will both come off the bench. Green was the defensive player of the year a season ago, while Thompson is arguably the best three point shooter in the league. The rest of the reserves for Team Steph include Jimmy Butler and Karl Anthony Towns of the Minnesota Timberwolves, Damian Lillard of Portland, Kyle Lowry of Toronto and big man Al Horford of the Boston Celtics. 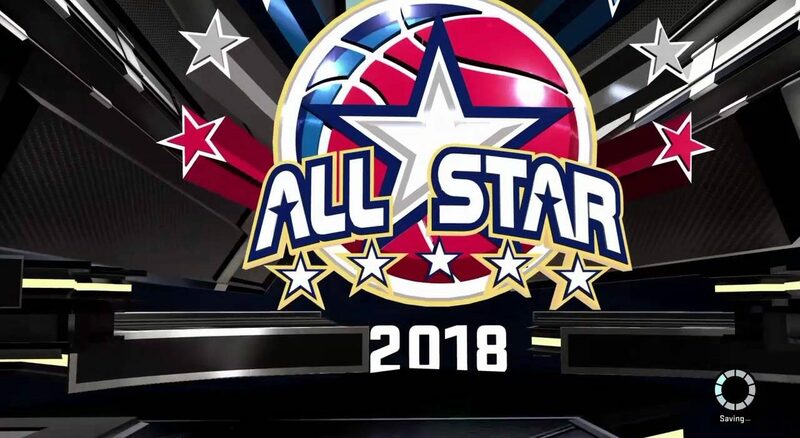 There is a look at the 2018 NBA All Star Game. If you are betting on the game, just be careful, and be sure to use good bankroll management. Remember, very little is actually on the line for the NBA All Star Game. We would recommend Team LeBron, over Team Steph, but it’s awfully close. You are talking about the greatest basketball players on the planet. Also, make sure you check out the prop bets for the games, and all of the bets revolving around the NBA All Star game on Saturday. Best of luck with all your betting, and enjoy the NBA All Star Game. Make sure you check out our US sports betting sites for all the best odds!